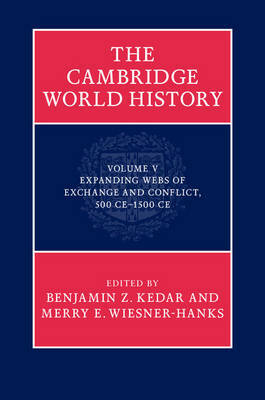 Author(s) Kedar, Benjamin Z.; Wiesner-Hanks, Merry E.
Volume 5 of the Cambridge World History series uncovers the cross-cultural exchange and conquest, and the accompanying growth of regional and trans-regional states, religions, and economic systems, during the period 500 to 1500 CE. The volume begins by outlining a series of core issues and processes across the world, including human relations with nature, gender and family, social hierarchies, education, and warfare. Further essays examine maritime and land-based networks of long-distance trade and migration in agricultural and nomadic societies, and the transmission and exchange of cultural forms, scientific knowledge, technologies, and text-based religious systems that accompanied these. The final section surveys the development of centralized regional states and empires in both the eastern and western hemispheres. Together these essays by an international team of leading authors show how processes furthering cultural, commercial, and political integration within and between various regions of the world made this millennium a 'proto-global' era.